This is truly inspiring. Great job Kansai! Please keep building those numbers next week. Noda is getting more nervous, and all politicians watch trends. Strong growth each week will help drive our message home. Also, a word of encouragement to anyone out there in the many smaller communities across Japan. If you're looking for a place to hold YOUR Friday 6PM protests, I suggest the front of the local DPJ office. The DPJ appointed this prime minister and his cronies. The DPJ failed to control him. The DPJ is very much a part of the nuclear problem in Japan. If you can't get to Tokyo or Osaka, please try to spend two hours on Friday 13-JUL from 6PM to 8PM in front of your local DPJ office. 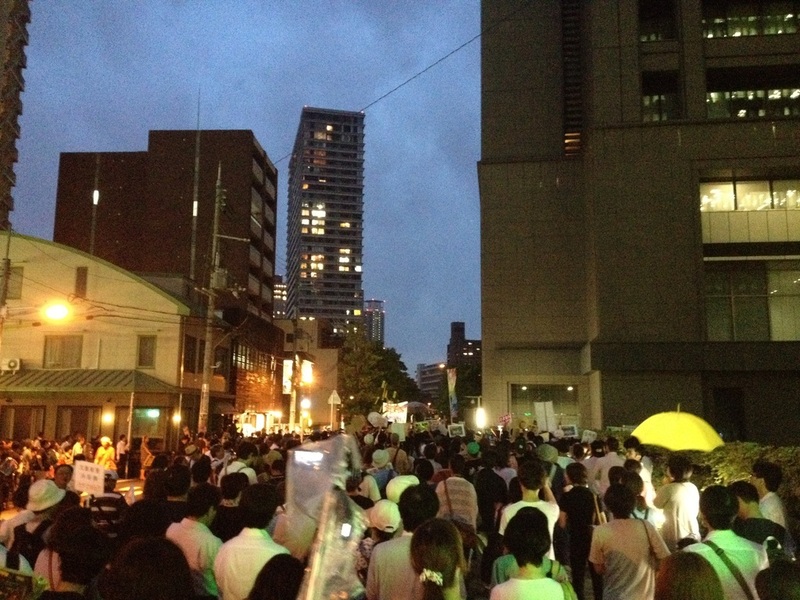 If a small group forms, you can shout Saikadou Hantai in solidarity with the mobs in Tokyo and Kansai . If it is only a few people, you could try simply speaking, and explaining why you are there to anyone who will listen. For example: (1) praying vocally for an end to the DPJ's nuclear war against the Japanese people, (2) reading aloud from transcripts of the Fukushima women's testimonies as broadcast by Tokyo Brown Tabby, (3) reading aloud the Japanese translation of Jonathan Schell's "Nuclear Energy Requires Perfection" essay at http://peacephilosophy.blogspot.jp/2011/06/nuclear-power-requires-perfection.html, etc. And please understand that even ONE PERSON, alone in front of a DPJ office can reach some people with the anti-nuke message. In time more people will stand with you, and you will have the sweet personal satisfaction of having started a local movement, all by yourself. CHANGE can start with YOU. If we are to make a better world for our children, we must do something. I hope you will try this idea.